The fashion steaks were high at the White House dinner in honour of David and Samantha Cameron. Sam Cam has more than held her own against the ever- stylish Michelle O during the Cameron’s trip to the USA. The ultimate battle though, was on the red carpet in Washington. Samantha Cameron wore a blue chantilly lace dress by British fashion designer Alessandra Rich. 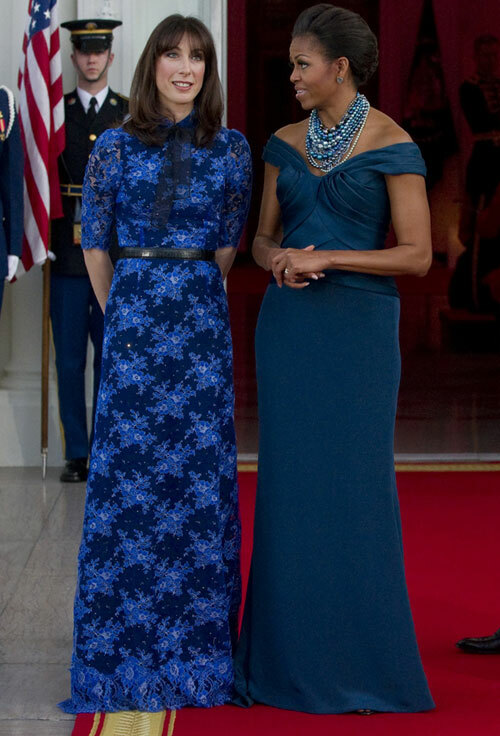 Michelle Obama wore a strapless teal dress by Marchesa with a statement Tom Binns beaded necklace. Sam Cam’s dress was very pretty but looked frumpy and too school-mistressy for a formal occasion. Worn with a much shorter underskirt, the design is sexier and shows off the gorgeous chantilly lace. Michelle Obama played it safe with a simple but structured off-the-shoulder dress. Her choice of necklace, a Tom Binns multi-stringed set of blue toned beads, added some interest to the look. Overall, a bit disappointing. Must try harder, ladies.